Ethiopian opposition party held demonstrations simultaneously in two cities. Ethiopian opposition activists on Sunday demanded the release of journalists and political prisoners jailed under anti-terror legislation in demonstrations in two major towns. In rare public outpours of anger, people marched peacefully in the towns of Gondar and Dessie, chanting "freedom" and carrying pictures of jailed politicians and journalists. Government officials said there were around 1,500 protesters in total in both towns, while the activists themselves claimed the number to be as high as 20,000. "The protests were peaceful and successful," said Senegas Gidada, protest organiser and chairman of the Unity for Democracy and Justice Party (UDJ) party. 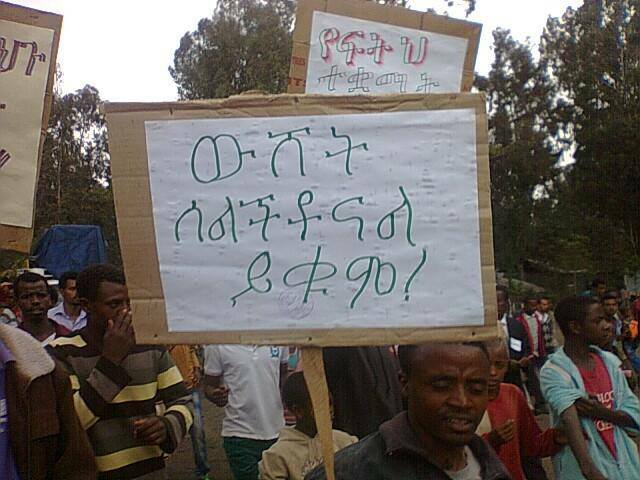 "We are unhappy about the lack of human rights and democratic freedom in Ethiopia," he added. The demonstrations follow a rally last month in the capital Addis Ababa when several thousand activists demanded the government adhere to basic human rights. The recent rallies are the largest since post-election violence in 2005 resulted in 200 people being killed and 30,000 arrested. "The cost of living is too high. We have no rights. 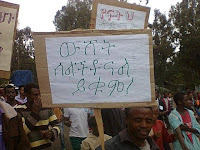 They took away my family's property and land and gave us no compensation," said one young unemployed protester, who asked not be named, but who was speaking by telephone from Gondar. "The dogs on the street have more freedom than we do. We are here to demand freedom and we will continue to protest until the government makes fundamental changes." But the government dismissed the protesters' calls. "The protesters are demanding the release of prisoners who have been convicted of terrorism, these are not pro-democracy protests," government spokesman Shemeles Kemal told AFP. "Most of these demonstrators are Islamic extremists. The government is not concerned by these demonstrations. They are meddling in religious issues and mixing them with political matters." The government had allowed the protests to go ahead despite earlier saying they had not received official permission.